The hope of hundreds of thousands of immigrants known as ‘‘dreamers’’ is gradually dying as President Donald Trump announced phasing out a program that protected young immigrants brought into the country illegally as children, Attorney General Jeff Sessions announced. The decision, after weeks of intense deliberation between President Donald Trump and his top advisers, represents a blow to hundreds of thousands of immigrants known as ‘‘dreamers’’ who have lived in the country illegally since they were children. But it also allows the White House to shift some of the pressure and burden of determining their future, setting up a public fight over their legal status that is likely to drag on for months. He called it an ‘‘open-ended circumvention of immigration law through unconstitutional authority by the executive branch,’’ and said the program was unlikely to withstand court scrutiny. 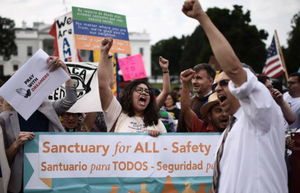 The Department of Homeland Security said it would no longer accept new applications for Deferred Action for Childhood Arrivals, which has provided renewable, two-year work permits to nearly 800,000 dreamers. The agency said those currently enrolled in DACA will be able to continue working until their permits expire; those whose permits expire by March 5, 2018, will be permitted to apply for two-year renewals as long as they do so by Oct. 5. New applications and renewal requests already received by DHS before Tuesday will be reviewed and validated on a case-by-case basis, even those for permits that expire after March 5, officials said. Trump administration officials cast the decision as a humane way to unwind the program and called on lawmakers to provide a legislative solution to address the immigration status of the dreamers. Senior DHS officials emphasized that if Congress fails to act and work permits begin to expire, dreamers will not be high priorities for deportations - but they would be issued notices to appear at immigration court if they are encountered by federal immigration officers. But a threat from Texas and several other states to sue the administration if it did not end DACA by Tuesday forced Trump to make a decision. Several senior aides, including Sessions, an immigration hard-liner who had said the administration would be unable to defend the program in court, lobbied him to end DACA. Others, including Chief of Staff John F. Kelly, the former DHS secretary, cautioned that terminating the program would cause chaos for immigrants who enjoy broad popular support. Sessions wrote a memo Monday calling DACA unconstitutional, leading acting Homeland Security Secretary Elaine Duke to issue a memo Tuesday to phase out the program. The decision came on the day set by Texas and several other states to pursue a lawsuit against the Trump administration if it did not terminate DACA. It is unclear whether the states will still move forward with legal action.